Cuban inspired tropical prints and bold color. Reese presented her signature fit and flare dresses among other ensembles and also hinted at a romantic spring affair with white lace and eyelets. Graphic black and white ensembles followed by florals and color were the highlights of this runway which featured many different styles. For those with a global perspective who are looking for the right clothing to show it, Donna Karan's earthly pieces will definitely do. Modern graphics and lots of chiffon came together on Carolina Herrera's runway to create long feminine silhouettes. From evening dresses to skirts and cropped pants an easy breezy spring defines this collection. Kate Middleton is major fan and I think I know why, Jenny Packham’s spring 2014 collection featured impeccable flirty spring time dresses and gowns. From the bejeweled detailing to the exquisite embroidered chiffon dresses her execution was flawless. Blue, blush pink, mustard yellow and oxblood shades were among the standout colors. Be on the lookout for these colors to headline your spring wardrobe. When it comes to great basics and comfort, Steven Alan’s Spring 2014 collection hits the mark. His spring 2014 collection represented the epitome of springtime slouch. The collection featured classic lounge wear, oxfords and mirrored shades to complete an effortless chic spring look. I love the Jenny Packham dresses! Beautiful! Jenny Packham's dresses are gorgeous. I can totally see why Kate Middleton is a fan! They're so her style. Beautiful outfits! Loved all of these photos! I am in love with the black and white mastroianni!!!! I love the bold prints! And Jenny Packham's stuff is gorgeous! All of these outfits are adorable! I would love to attend NYFW someday. The white dress is my favorite! This would be a fun event to attend. I love the bold colors of the first collection. They are so pretty! These are all so pretty! My favorites are the ones by Joanna Mastroianni. Loving the Tracy Reese pieces! Loving Donna Karan and Jenny Packham!! That Joanna Mastroianni dress on the right is stunning. I want, I want. I like the Jenny Packham's dresses. So cute. What beautiful pieces! I am loving the pink Jenny Packham dress! Thank you for sharing! 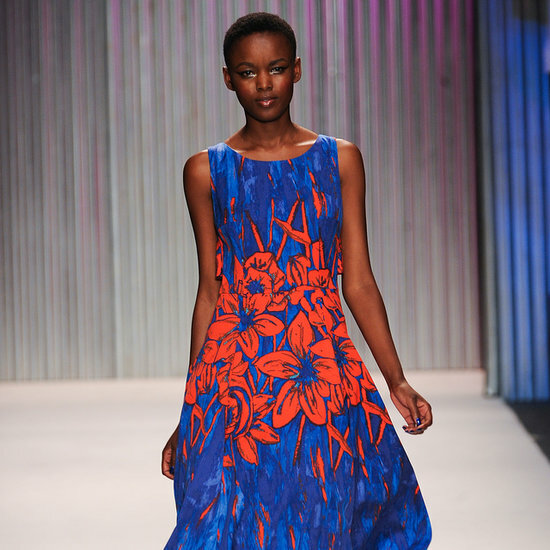 Love the tropical prints, and the Donna Karan dresses! Tracy Reese is so bright, I love it! I have Tracy Reese, but the other designers don't look like they can transfer to street wear. Beautiful! I'm loving the caftan pieces. I love the more simple looks. I could totally see myself wearing a few of these outfits! Love that blue dress with pops of red! So pretty! I am totally in love with the Jenny Packham dresses! I could see myself wearing those! There is a Steven Alan store right near me! Love! There have been some really great colors and textures this year. I adore Jenny! I love the shades of color. Jenny is my SHERO!!! Love her outfits, lover her designs!!!! Wish I could afford her..lol. Jenny's dresses are beautiful! I love how they flow and their colors. I love the caftans more than I thought I would. Very chic. These are amazing collections! I hope that I'll get to go to NYFW next season!